Classes are designed specifically for the ages and needs of the children in the group. We explore poses, learn breathing techniques, play games, and create art while going on themed yoga adventures! We provide classes for in – home daycares. Classes typically last 30 minutes, and involve a warm-up activity to get the body moving, followed by some breath work and then the bulk of class usually consists of a story that allows for plenty of opportunities to mimic the characters with fun poses. Class always wraps up with some stretching followed by a Savasana or “lie down time” song. 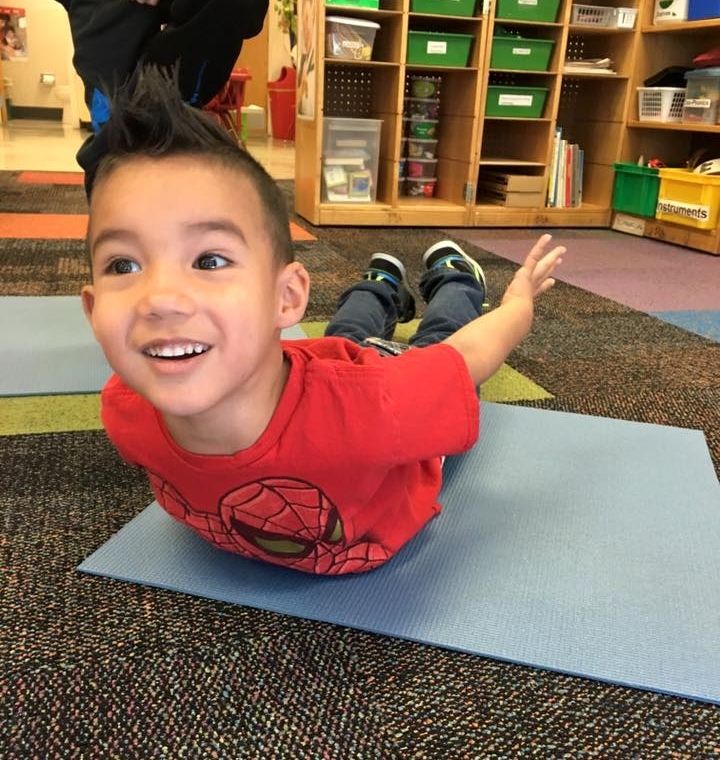 Preschool classes are very similar to daycare classes, but usually involve one or two extra activities, such as using yoga cards or going on yoga adventures. Depending on the age of the students, classes last between 15-30 minutes. Our warm-up involves a song like "Tick-tock Yoga Clock" or doing the "Noodle Dance," and then we connect to our breath with some breathing exercises. We typically read a story or play with yoga cards that have poses and games on each card. We always end with a game and then some quiet time for Savasana to rest the body. Currently teaching at Teaching Tree, Children's Workshop and Little Bears Child Care. Elementary school aged classes vary from week to week but typically follow a warm up activity, an activity to connect to our breath, and then can go from yoga adventures to yoga obstacle courses to partner work and games, to creating your own yoga story to share with the class. I try to be flexible (no pun intended) with the curriculum to account for the varying ages at each school. Class always ends with some stretching and cool down, as well as a Savasana song to lie down and relax to. Currently teaching at Global Village Academy, Dunn, Riffenburgh, Linton Elementary and 1st Choice After School Kare.